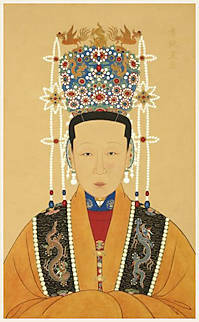 Zhu Changlou, the 14th Ming emperor, only had the pleasure of wearing Heaven's Mantle for one month. Son of concubine Wang, later Empress, he was born in 1582 as the eldest son of the Wanli Emperor. Zhu Changlou took the reign title of Taichang upon his succession to the throne in 1620 at the age of 38 following the death of his father. His temple title was Guangzong, which means "Lustrous Ancestor". He was yet another example of a son who succeeded to the throne because he was the elder son, but with a father who had a different favorite heir. In this case it was Zhu Changxun, the son of the Wanli Emperor's favorite concubine, Noble Consort Zheng. The reign of Zhu Changlou, the Taichang period, was the shortest of any Ming emperor. He was enthroned on August 28, 1620 and and died suddenly on September 26, 1620 - just 29 days later. Intrigues were by now rampant in the Ming court. Several factions were jockeying for power and influence and even murder was no hindrance for furthering someone's ambitions. Concubines, ministers, eunuchs were all over each other in ever more complex alliances aiming at eliminating opponents. Lady Zheng did her best to eliminate the emperor so that her son could ascend the throne. She is alleged to have arranged a foiled assassination attempt at the emperor; she also presented the emperor with many beautiful women to wear the emperor to death. As it were Zhu Changlou soon fell ill and, brushing the emperor's court physician aside, the Minister of State Ceremonies Li Kezhou offered him some red "cure all" pills. At the same time his favorite concubine "Western Li" was banished from his bedside. The emperor died shortly after. 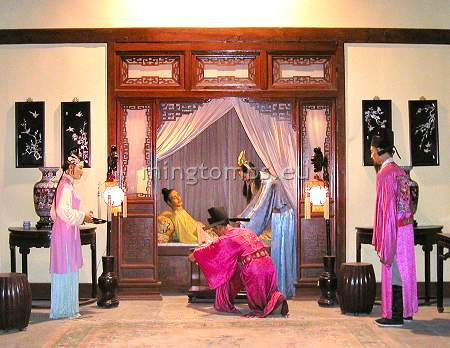 It is commonly believed that Zhu Changlou was murdered and that concubine Zheng was behind the assassination. It almost goes without saying that the empire continued to slide towards its demise. Common folks were frustrated over the many court intrigues and were desperate for a benevolent ruler. It was in fact the "eleventh hour" for this dynasty. Qingling has a very unique layout for a small to medium sized Ming tomb. The Sacred Way starts at a small bridge spanning a narrow river skirting the western side of the sacrificial section. Behind the bridge is the memorial stele -originally housed in a square building with openings on all four sides. The main gate is now in ruins apart from the stone platform and sections of the side walls. But the wall surrounding the sacrificial section has been nicely restored. The sacrificial section ends in a simple gate. Behind it -in open land- is a triple span marble bridge. The burial section lies far further back and completely separate from the sacrificial section. In the burial section the columns of the Double Pillar Gate still stand. Also the stone altar with its five ritual vessels are extant. The Soul Tower on top of the Square City has been fully restored back to its original splendor. The mausoleum is closed to the general public. It's Not my Tomb ! Zhu Changlou was interred in Qingling, located at the southern foot of Huangshan ("Yellow Mountain") Temple Ridge of Tianshou Mountain. 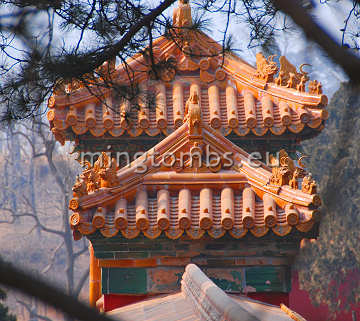 It covers an area of 27,600 square meters, a standard size for small to medium sized Ming tomb. He never had the opportunity to control the construction of his own tomb and so ensure that it would be something special. He died so soon after accession that construction could only start posthumously, more specifically in March of 1621, the year after he passed away. But it was highly improper to keep the deceased emperor unburied for the many years it would take to build the requisite underground structures. A quick decision was made to inter Zhu Changlou in the grave originally excavated for 7th Ming Jingtai Emperor (r. 1450-1457). Indeed, the above ground structures were only completed five years later. 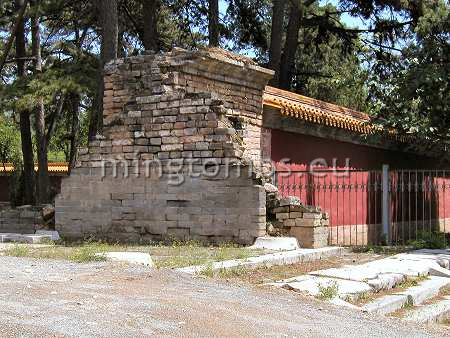 This grave lay abandoned after 8th Ming Tianshun Emperor had ordered it to be destroyed in revenge for having been imprisoned by his brother (the Jingtai Emperor) in The Forbidden City. 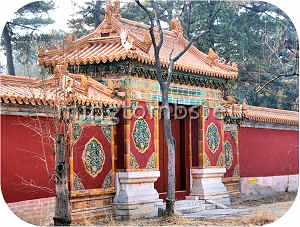 The Jingtai Emperor had instead been interred in a prince's tomb in the western hills of Beijing. It was probably a wise decision to recycle the remains of the existing underground palace considering that it took some five years to complete the above ground structures and body preservation techniques were not very sofisticated. Inadvertently, the location did not show much respect for earlier deceased Ming emperors; basically Qingling lies squeezed in between the Zhengtong Emperor's tomb Yuling a little to the north and the Hongxi Emperor's tomb Xianling, a little further south. 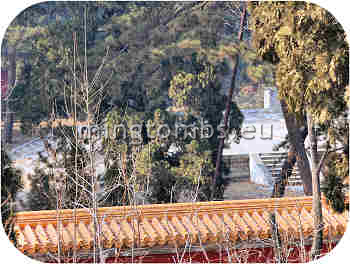 However strange the circumstances, this is one of the more interesting Ming tombs from a layout point of view. First, the sacrificial and burial sections lie independently far apart -each in its own enwalled area. Second, a small, winding brook adds extra "Qi" and allows for a neat addition of ornamental bridges. Most visitors get out of their vehicles, snap a photo or two of the front part and get back on their way. The photos above are what most tourists take away with them. Few notice the small footpaths leading to the back of the sacrificial section where some special features only found in this Ming tomb await the persistent tourist. But before revealing that, let's first explore the areas from the beginning, that is, the southern tip. 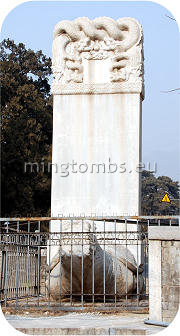 The bridge and traditional memorial stele without inscription front the mausoleum. The first structure of the mausoleum is the single-spanned marble bridge, which crosses a small stream in front of the memorial stele. The bridge has been restored but the river has dried up. 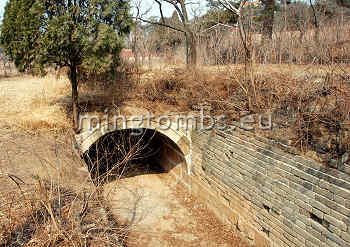 The banks of the river were reinforced with brick walls and doubled up as part of the drainage system of the mausoleum. Trees are gradually growing out through the brick walls. This stream meanders to the south-western corner of the sacrificial section and then continues along the western tomb wall. North of the sacrificial section it bends back towards the east and then north finally disappearing into a culvert. North of the bridge is the memorial stele resting on the back of a tortoise shaped animal placed on an elevated stone platform. It was originally placed inside a square building with openings on all sides, but the building has long since collapsed. Nowadays a low wall surrounds most of the stele. The front gate (photo above) of the sacrificial section is a 3 by 2-room building, presumably originally with a hip and gable, single eave roof. In stark contrast to the surrounding wall the gate lies in ruins with only part of the side walls standing. From the remains you can tell that the inside of the gate had been painted yellow -the outside was held in the traditional vermilion color. The original side halls -the eastern one for storing ceremonial objects and the western one for chanting religious scripts have collapsed and have not been restored. Nothing seems to remain of the eastern and western silk burners. The main sacrificial hall was a 5 by 3-room structure also covered with a hip and gable roof. I do not know whether it was a single or double-eave roof, but most likely the former since the emperor's rule was inconsequent. My photo shows that parts of the side walls and the back wall are all that remain. The usual large stone platform in front of the sacrificial hall has survived until today, but the balustrades are long gone. 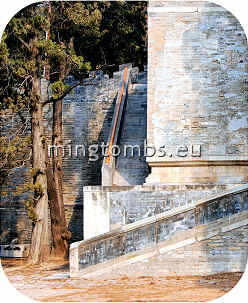 The stone platform has the usual three flights of steps with a Danbi Stone in the center of the middle one. 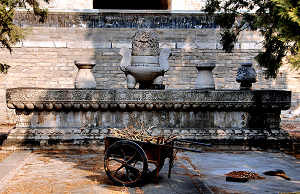 The stone carries both the phoenix and the dragon sculptures symbolizing the empress and the emperor, respectively. The platform had separate, smaller stairs on both sides. The entire platform itself is large, which is rather unexpected in a tomb not built by the tomb occupant himself and in circumstances where the dynasty was in financial and political difficulties. The wall around the front, sacrificial area has been restored. Since this section lies far away from the back, burial section a backdoor has been inserted into the rear wall of the sacrificial section. This should not be confused with the traditional Triple-door gate, which can be found further north as the gateway into the burial section. Despite it only being a single opening door, it is a splendid example of the rich decor the empire was capable of. Green and yellow glazed tiles form beautiful patterns and have survived the onslaught of the elements and tourists. The gate has a single eave, gabled roof covered with yellow glazed tiles. Apparently this unusual backdoor also formed part of the original early 17th century construction. Looking north from the single door gate the visitor can enjoy a tranquil and rustic view. The inner Sacred Way at first leads to yet another bridge followed by orchards and grass fields to the west and a small, sloping hill on the right. Some hundred meters in the distance the vermilion painted Triple Gate of the burrial section of Qingling peek through the many trees. But at first one traverses a small, three-span and single arch white marble bridge. Except for some minor repair work the bridge surface is still covered with the original, large marble slabs. The balustrades are on the other hand clearly relatively new. This beautiful white marble bridge lodged snugly in between the green trees adds an unusual flavor to this already unusual tomb. The bridge spans the east-west section of the earlier mentioned internal, small river. Only few Ming tombs boast an internal river. 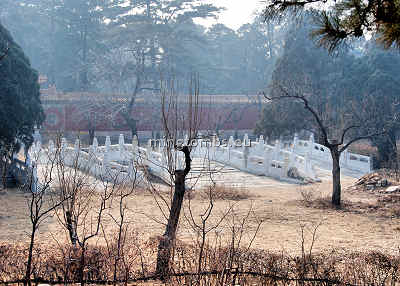 The only other Ming tombs with an internal river were Xiaoling, the tomb of the 1st Ming emperor Zhu Yuanzhang, and Xianling, the tomb of the 4th Ming Hongxi Emperor. 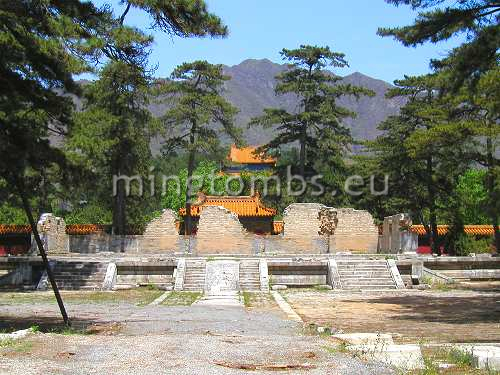 The latter tomb is also the only other Ming tomb where the two main sections are completely separate and far apart. The river swings north but soon dives into a covered water tunnel. It resurfaces at the eastern side of the burial section where it also serves as a drainage canal. Crossing the bridge and proceeding towards the burial area one arrives at the Triple Gate, the entrance to the burial section. A small hill is hugging Qingling on the east, which is yet another reason for the small river going underground. The rear burial area has been largely reconstructed and painted in the imperial vermilion color. The triple gates in its center have been rebuilt although the emperor shall no longer pass through the center one reserved for his exclusive use. 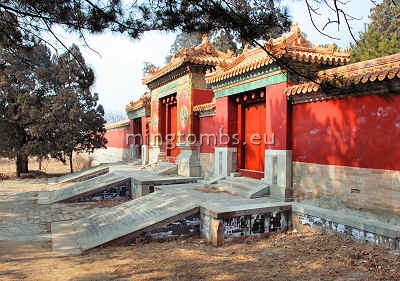 The burial area was equipped with the traditional Lingxingmen, or Double Pillar Gate, but the doors and ornamental roofing has not been restored. Also the traditional stone altar with its standard five ritual vessels, the incense burner, the candle holders and the vases has survived the tides of time. The western stone vase has temporarily been removed for restoration. The stone altar itself is almost hidden in the shadows of the evergreens. The Soul Tower, has been fully restored to its original, impressive state. Most photos in Ming tomb literature show the pre-restoration Soul tower of Qingling as a very dilapidated building with grass growing wild in the roof. My photo further above clearly evidences that resources have been spent on bringing the tower back to its past glorious splendor. The yellow glazed tiles sparkle in the early afternoon sun as they were intended to. Access to the Precious Citadel is through the tunnel at the center bottom of the Square City. But access to this tunnel is through a side staircase and not the usual frontal massive access slant. And the access to the Precious Mound itself as well as to the Soul Tower is via side staircases originating in the front of the court yard instead of the more common access ways starting in the Precious Citadel on the back of the Soul Tower. The area between the Square City and the tomb mound is similar to that of Zhaoling. Owed to the massive and elevated mound, a separate wall was erected at the south end of the mound to prevent the mound to link up with the Square City. This in turn created a deep, paved, crescent shaped yard called yă bā yuàn. 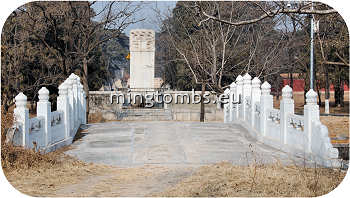 Tomb occupants are the Taichang Emperor along with empresses surnamed Guo, Wang and Liu. Lady Guo, formally Empress Xiaoyuan Zhen, came from Shuntian Prefecture Beijing. She was born 1580 to father Guo Weicheng, Marquis of Boping. Her mother is unknown. She became a princess of the imperial court in 1601, but did not give birth to any sons and died in 1613 from illness. She was at first buried south of Changling, Tianshou Hill. After Zhu Changlou succeeded to the throne in 1620 she was given the posthumous title of empress and her remains were moved to Qingling. 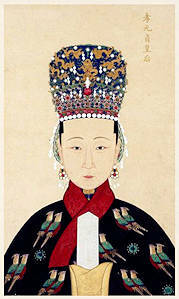 Empress Wang was also from Beijing. She was born 1582 to father Wang Yue, Count of Xincheng and mother Countess of Xincheng. She was promoted to Talented Lady when on 23 December 1605 she gave birth to the succeeding Tianqi Emperor. She passed away in 1619 before the emperor and her remains were re-interred in Qingling the following year in connection with the funeral of the emperor. Lady Liu was born 1588 in Beijing to father Liu Yingyuan, Duke of Ying and mother Lady Xu, Madame of Ying. In February 1611 she gave birth to Zhu Youjian, the later Chongzhen Emperor. She however fell from favor from Zhu Changlou and died from punishment ordered by him already in 1615. 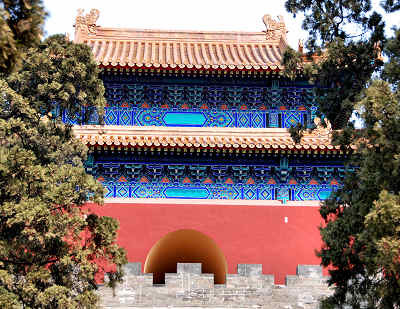 At first her resting place was kept secret, but in 1620 when her son was bestowed the title of King he managed to obtain the tomb location in the Western Hills of Beijing from his attendants. When her son succeeded to the imperial throne in 1627, he granted her the posthumous title of Empress Dowager and had her remains moved to Qingling to be buried alongside her husband.